Defending Chris Johnson: Was His 2012 Campaign Really That Bad? Archived Content Defending Chris Johnson: Was His 2012 Campaign Really That Bad? 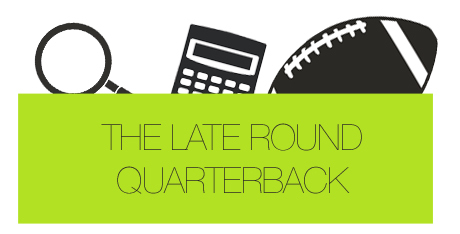 Often, in fantasy football, we get a lot of noise and chatter in the ether. Twitter has made it easy to get our news, opinions, frustrations, and whatever else out into the ether extremely easy. Often, what you will see on Twitter is a runaway train of news, ideas, or narratives. That is, people get angry or have an opinion about a certain thing, and that opinion sort of snowballs into a much bigger deal than it deserves to be. Enter: Chris Johnson’s 2012 fantasy season. Johnson was vilified, hated, and made the poster child for all things wrong with fantasy football. People cursed his name, and at one point people asked whether or not CJ?K was droppable. But, the question to me, was simple: Is Chris Johnson really that bad from a fantasy perspective? My honest thought, after running some numbers, is no. JJ posed some interesting theories that provide the basis for my searches here. What I rely on here is that rather than being a cumulative game, fantasy football is a week-to-week affair. As a result, you have to look at stats and finishing positions on a week-to-week basis. Further, because running backss can only replace other backs, I compared Johnson only to how he finished within his position. All-position ranks are pretty irrelevant for the most part, since in most instances you cannot swap a quarterback for your running back (barring an offensive player position), and further you can never swap in a wide receiver or any other position in your RB1 slot. 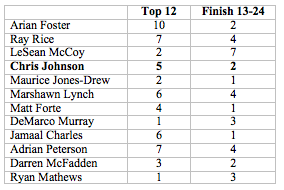 Essentially, for this analysis, I looked at the top-12 fantasy running backs drafted in 2012. Ostensibly (though not always) these would be all the RB1s starting in a 12-team league. I then looked at their performances week-to-week from weeks 1 through 13 – which constitutes the regular season for most leagues. I figured out how many times each running back finished top 1-12 amongst running backs under standard scoring. This, in theory, would give you the guys who should have been RB1 players in an ideal-lineup situation. I then also looked at how many times these guys finished in slots 13-24. What I hoped to look at there was, if the guy did not finish 1-12, was he at least startable in a 12-team league with two running back positions. While not a perfect measure, whether a guy is your RB1 or your RB2, the points count the same, so really as long as a guy in either running back slot finishes in the top 24 he was a viable starter in that spot in a 12-team league. More than half of the weeks you played him, Chris Johnson was a viable starter and was as effective starting as Jamaal Charles, and more effective than MJD, Matt Forte, and Ryan Mathews. It also doesn’t account for the fact that Johnson had some stinkers that killed you early. You would have had to show a ton of patience to keep starting CJ?K, but if you did, you were repaid for your patience at a fairly good rate. CJ did nothing early, and I get it – that’s a tough pill to swallow. 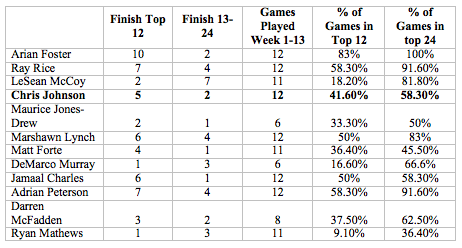 But weeks 5 through 13 count exactly the same (and maybe even more when you count for the fact that many of them are tougher plays as bye weeks) as weeks 1 through 4. 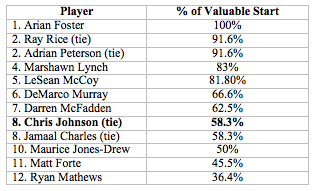 If you stuck by your guns, Chris Johnson performed as the RB1 you drafted him as more frequently than half of the other guys in the same position at the beginning of the season. 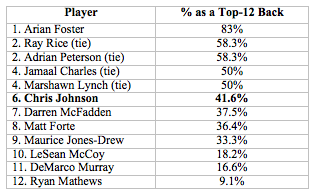 He was a viable back as often or more often than a quarter of guys drafted to be the top back on your team.When you needed him to be a top-12 back, Johnson performed more often than McFadden, Forte, MJD, McCoy, Murray, and Mathews. Of course, these measures are not perfect, the numbers do not account for how often Adrian Peterson absolutely beasted it, nor does it really differentiate between a guy who finished 1 and a guy who finished 12 (or, for that matter, a guy who finished 13 and a guy who finished 24). I understand it’s tough to show patience, and trying to figure out when to cut the cord with a guy that might be on the downslide of his career is an extremely difficult task for fantasy owners to perform. What I’m saying here, in the end, is to stick by your guns. These things tend to be blown out of proportion, especially in the early weeks of a season. Sometimes, a little bit of patience (or a little bit of buy-low wisdom) can pay off, big time.